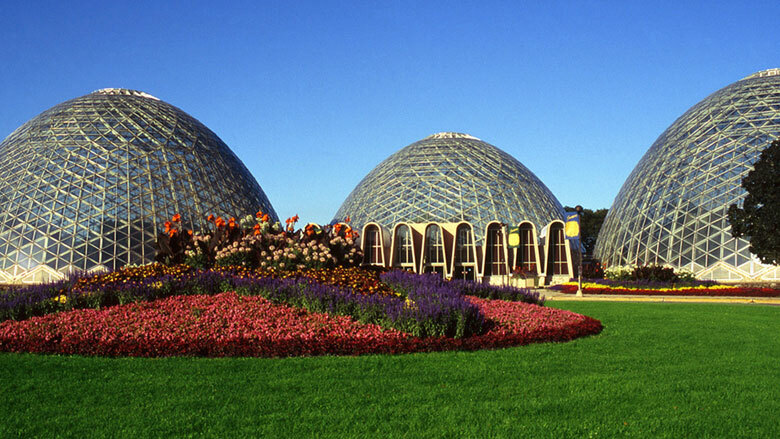 On March 22, 2017, the Washington DC-based National Trust for Historical Preservation granted “National Treasure” status to an iconic Milwaukee landmark: The Mitchell Park Horticultural Conservatory. Constructed in Mitchell Park between 1959 and 1967, the Domes consists of three beehive-shaped glass structures, each 140 feet in diameter at the base and 85 feet high, connected to a central lobby area. Developed by Milwaukee architect Donald L. Greib, the unique design permits over 85% of available light to be transmitted to the plants through quarter-inch thick, wire-reinforced glass. Each dome provides a unique horticultural experience: the Desert Dome features unique plant species adapted to survive extreme temperatures and droughts; the Tropical Dome displays over 1,200 species of rainforest plants as well as a few exotic birds; and the Floral Show Dome houses cultural-, historical-, and artistic-themed plant exhibits. The Domes have been a center of community life in Milwaukee for generations, hosting weddings, concerts, educational programs, and tours for nearly 250,000 annual visitors. However, in recent years the Domes have fallen into disrepair. In January of 2016 they were temporarily closed to ensure the safety of employees and visitors. Even though they opened later in the year, it became clear to Milwaukee County officials who own and operate the Domes that a plan was needed for their long-term preservation. To address this, the National Trust, along with the Milwaukee Preservation Alliance, are launching a public campaign to support a preservation solution for the Domes and issuing a report (along with engineering firm Wiss Janney Elstner Associates) that puts a $18.6 million price tag on a comprehensive rehabilitation. It’s a price worth paying to preserve this “stunning and absolutely one-of-a-kind place,” says Stephanie Meeks, president and CEO of the National Trust for Historic Preservation. Meeks says that creative modern architecture often demands equally creative approaches when it comes to restoration. “Rather than risk losing this iconic piece of Milwaukee’s heritage, we need a thoughtful, long-term preservation solution for the challenges facing the Domes,” says Meeks. Nivedita (Nita) Sharma, is a recent graduate of the University of Wisconsin Madison, where she studied biology and psychology and pursued certificates in gender and women's studies and global health.